With the modern technologies, creating directory website is easier than ever. You can go for a CMS like WordPress to create your website or rely on the easy directory software builders to create an online directory. One of the ways through which you can make money through your Directory website is by providing Membership. This can be achieved by controlling the access of the data on your website. Making money through membership works well when your website hosts some exclusive data. This data can be in form of video content, text information, contact information, etc. 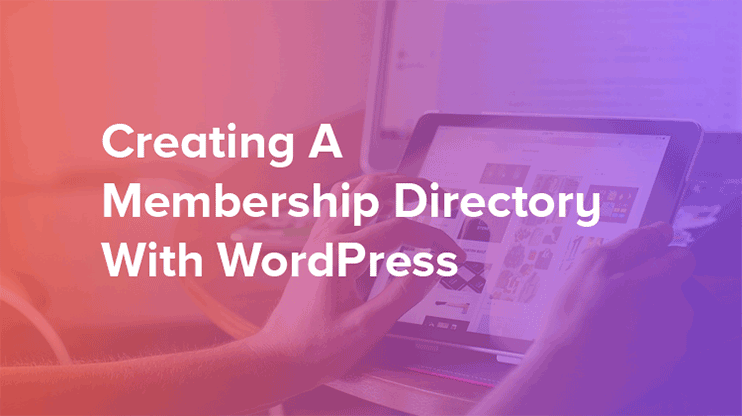 In this tutorial, we will see how you can create a membership-based directory with WordPress. How does membership websites work? How does Online membership directories work? Membership based website lets you earn by providing paid access to the data on your website. For instance: Membership based video websites, where general visitors are allowed to view only a part of the video. But to view the whole movie/documentary, you need to subscribe to their membership plan. The pre-requisite for a membership website is that your site should have content that is unique. People should want to pay for the content on your website. For instance, an educational website that runs online coaching. Some of the online courses are free. But then, there are paid courses, and that’s where membership works. The paid courses work on the membership basis. The interested students can sign up for the course by paying the fee. Being a member and having paid the membership fee enables them to access the protected content on the website. We have selected WordPress and the Directory Template from Templatic to create our membership website. Because WordPress is a free and open source. Moreover, it is very easy to use. And the best of all, you have pre-designed and fully functional membership directory templates to create membership directories. The one we will use for creating membership directory is the Directory WordPress Software. Or you can go for this membership Directory Software to create your online membership-based directory websites. For any kind of website, we need to start with the domain name and hosting service. To get the domain name as well as hosting, you can rely on any reliable services like Godaddy, Bluehost, NameCheap or SiteGround, etc. So for the domain name, we will go for GoDaddy which is one of the leading domain name registrars. The domain name is typically the identity of your website on the widespread internet. So choose it carefully. 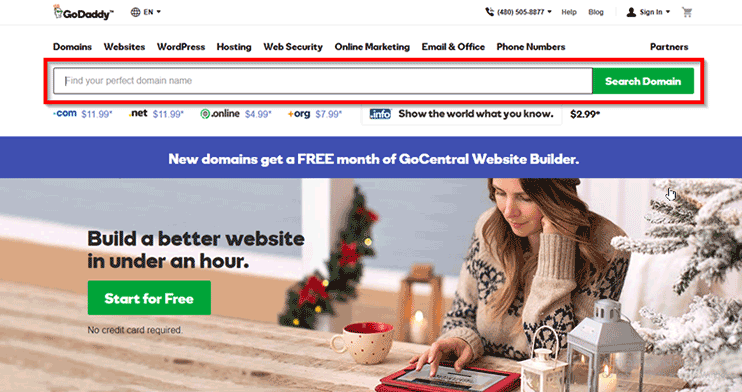 You can use the search bar at the GoDaddy website, to find out if the domain name you want is available (or already taken). If the domain name is available, you can reserve it by following the procedure directed by GoDaddy. If the domain name you want is already taken, try a different variation and settle for one that suits your website and is available. Also be careful while choosing the domain extension. For hosting, I prefer the WordPress optimized hosting by Bluehost. Bluehost’s service is reliable, secure and efficient enough to handle directories with medium to large traffic. However, you can choose any hosting service based on your personal experience, recommendations and the requirements of your website. Changing the domain name and host is possible at a later stage, but it’s not very convenient. So it is highly recommended that while choosing the domain name and the host, you consider all your requirements and make sure that the name/service you choose satisfies them. Now that we have our domain name and hosting ready, we’ll move forward with our directory membership website. We have chosen WordPress for our membership-based Directory website due to the reasons listed above. However, to create a WordPress membership directory website, we will need a proper software to support the membership features. The Directory WordPress Software along with the Access Manager plugin lets you do this easily. No technical skill or programming knowledge required. Therefore, we will go for the Directory software + Access manager to create a Membership Website. You can download the Directory Membership website WordPress theme from here. First of all, we will install the theme to activate the directory software that is pre-configured for displaying online listings of any kind. The WordPress directory theme can be installed just like any other WordPress theme. More information about the installation steps is available in the theme user guide available on the theme download. Once the theme is installed and activated, I highly recommend installing the sample data by pressing the blue button on your WordPress dashboard. As soon as the sample data is installed, you will have a directory website similar to the one you see here. To personalize your website, you need to first change the site logo and title. If you have your logo image ready, you can immediately upload it to re-brand your website. Moreover, you can change the colors as per your wish. Set the colors to the fonts, buttons and the background of your website. The Directory WordPress theme comes with a live color customizer to let you change the colors for your website as and when required. For any website menus are the primary way for user’s navigation. The menus show the visitors what the website has to offer. To create a menu, first, you must make a list of links to all the important pages on your website. Organize them into a hierarchical form to create your menus. Here’s a useful article on how you can create menus with WordPress. The access manager plugin is designed to let you integrate the membership feature into your WordPress Directory website. With the above steps performed, we have a ready to go Directory website. However, the membership features in your Directory website can be included by adding a plugin (and it won’t take more than 2 minutes to get started promise!). So, to integrate the membership features, we will use the Access manager Directory add-on. This add-on is configured to control the access and create membership features on your WordPress website. The access manager plugin adds an additional tab to the monetization menu. 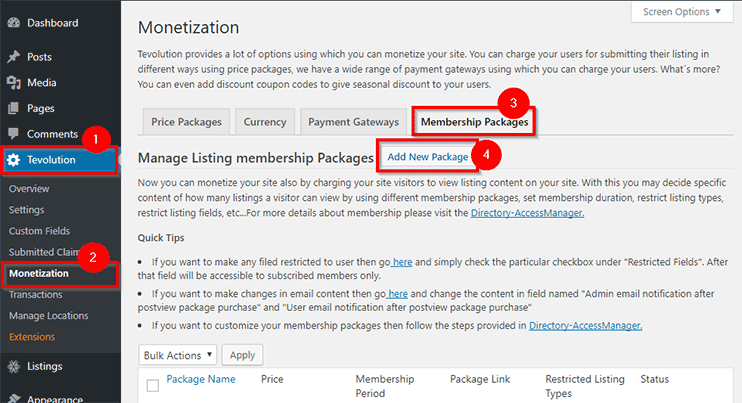 This tab called the “Membership packages” will let you add all the packages your members can subscribe to. Creating a membership package is easy. All you need to do is to click “Add new package”, fill in the details of the package and make it live for your site users. You can create as many price packages as you want. These price packages will be displayed on the front end to the visitors. They can choose the pricing package as per their wish and subscribe to membership on your website. Once you create your website and make it live, the next step is to find an audience for your website. You can do this by advertising your website on different platforms. Promoting your membership is important because with advertisements you can not only inform your potential users about your website but also inspire them to subscribe to your membership directory website. First of all, you need to decide the target audience of your website. For example: If your membership directory is a Learning Management system, then your target audience is the students. Based on the target audience, you can decide the medium of advertisement for your website. Also, this depends on the scope of the content of your website. Suppose the scope of your educational website is limited to the syllabus of a specific university. This gives you a precise idea of where and where not to advertise. Therefore, before you actually reach out to advertise your website, you should consider that the advertisements are reaching the targeted audience. One of the ways through which you can advertise is Google AdSense. This is a smart way of advertising your website so that it reaches the right people at right time. Google AdSense is designed to display advertisements to a user based on the cookies stored in their computer browser. Therefore it ensures that your website is promoted at the right place. Besides website designing and creating, one of the main tasks is maintaining it. And maintenance of a website is not a one time task, it is recurring. A website maintenance tasks involve many small and large processes that you must follow in order to keep your website running smoothly. Here is a useful article regarding WordPress website maintenance that can guide you regarding your site maintenance routines. However, there is few maintenance routines particular to a membership Directory website. Because they add fresh new content to your website which is good for the SEO of your website. Because they are a good way to keep your users updated about the latest news and happenings of your business. Blogs are beneficial to your website in one way or the another and therefore, keeping your website updated with latest blogs and articles can actually help the overall growth of your membership directory. Membership directories are easy to use and maintain if you choose a proper platform to do so. Therefore, if you have content that you can provide on the subscription basis, you can start right away. Hope this article helps you create membership directory with ease. Do let us know if you have any suggestions, or tips on how you to create membership directory then let us know through the comments below. Looking for technical assistance with your WordPress website? We have been a part of the WordPress world for a decade now. And at Templatic, we have an excellent support team that loves to help our customers with their queries. If you are looking for technical support for your WordPress websites, we can help you!